The whole is greater than the sum of its parts. Con is like that. A massive horde of gamers, geeks, sci fi fans, and all other manner of like-minded folk take over downtown Atlanta, GA, every Labor Day weekend for DragonCon. And if you’re reading my site at all, they likely have something that would be of interest to you. The way DragonCon is structured is that there is a series of “tracks” about various special interests, raging from horror to Star Trek, Star Wars to costuming, gaming to writing, wrestling, and so many more. The schedule, when it comes out, goes on for pages and pages of descriptions of the tracks and the various panels within them. There’s even a track for skeptics, which I suspect would interest one friend and fellow writer of mine. And it’s not just fans that come. Most of the cast of the ScyFy show Warehouse 13 was there. Many players from True Blood, John Barrowman of Torchwood and Dr. Who fame (who will be on the new show “Arrow” this fall) were all speaking and signing autographs. I got to hang out with Richard Hatch, Apollo from the original Battlestar Galactica briefly in one of the hotel bars. Writers more your speed? Kevin J Anderson, R A Salvatore, Laurell K Hamilton, Timothy Zahn, Mercedes Lackey were just some of the writers there, telling stories about writing, sharing tips, and dropping hints of future books. 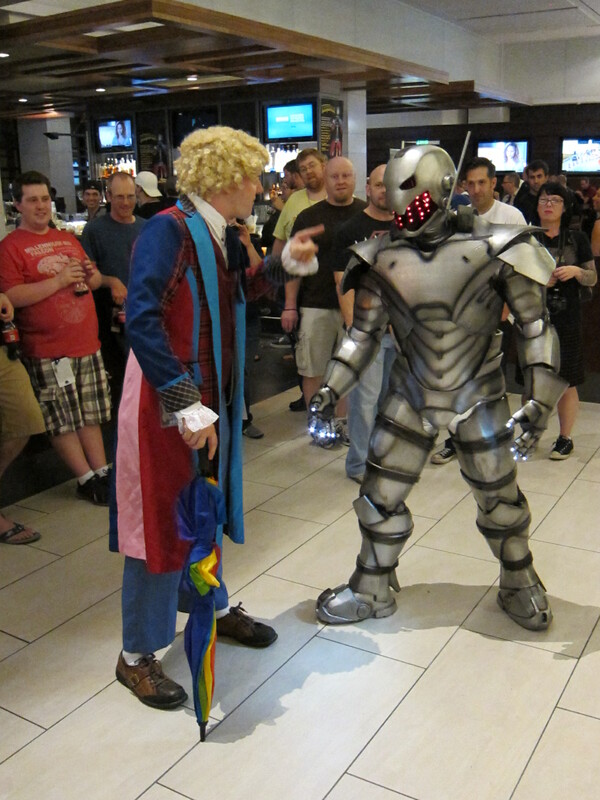 Dr. Who confronts Ultron--- only at DragonCon would this make sense. The Con is in five hotels, the Westin, the Sheraton, the Hyatt, the Mariott Marquis, and the Hilton, the last three connected to each other (and a nearby food court) by enclosed walkways, that many of us call “habitrails,” like the places for hamsters. The Marquis is in the middle of the three connected hotels, and as such, it’s the center of a lot. 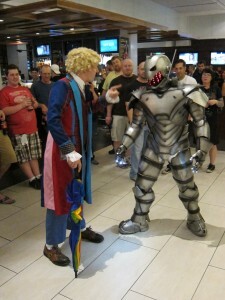 At the height of con, in the lobby area, it’s a huge press of fans, many of them in costume. Now, to be clear, you don’t need to be in costume to go to DragonCon. But a lot of folks do, and you ones that range from cheap Halloween “I guess I see what you were trying to do,” to some that look as good, if not better, than the ones in movies or on TV. And you’ll see popular characters, really obscure ones, and clever variations. One of the best last year was someone in the black and white suit John Travolta wore in Saturday Night Fever, topped with a Star Wars Stormtrooper helmet glittered up like a disco ball. This year, among others, I saw the Sun Maid Raisin Girl, a Stormtrooper Lifeguard, and many variations on Avengers. One thing I did notice as a trend in costumes. There were a very few of the DCNU ones, mostly the more classic character looks, at least from what I saw. But the DCNU can claim one victory. This is the first year I can remember not seeing anyone dressed as Oracle. That made me a tiny bit sad, I admit. Add in a near-perfect recreation of Dr. Who’s TARDIS, remote controlled R2-D2′s and a K-9 (also of Dr Who fame), and some amazing props, and you see some great stuff. For one of the contests, it’s not just costumes but some kind of actual story, and one of the entries was a great Captain America, along with women dressed as the dancers from his recent movie, recreating the bond-drive scenes. I got a very close look at Cap’s shield, and it was phenomenally well done, looking just as good close up as it did on stage for the contest. There are also two huge rooms (slated to be moved to separate buildings next year as the Con keeps growing) of dealers. They have replica weapons, action figures, toys, books (sometimes signed by the authors who are also there), games, props, about anything you could think of. There’s also a huge room of artists who sell and sign their work, and some at least will talk commissioned pieces. There’s just a giant air of celebration among all the folks who go to this. It’s a huge party where you already know you have at least something in common with most of the people there. And this year, they straightened out whatever problems they had with pre-registration last year, turning a multi hour long process into a matter of minutes. There’s a somewhat upscale urban dance club between two of the hotels, and the looks from the patrons waiting to get in at the river of costumes flowing past is just really entertaining. The only issues I noticed this year were minor, and more the doing of hotels, not DragonCon itself. One of the events in one of the ballrooms was shut down early after noise complaints. This seems a bit odd to me, that they book a hotel ballroom for a party that runs late near rooms where people sleep. Smacks of poor planning in my humble opinion. The Marquis, as I mentioned earlier the center of much of the partying/costume displays, also removed several sections of seating where in years past tired con-goes had sat to rest and chat. The staff of the Marquis lobby bar was also a lot more aggressive this year than I recall in past years about “If you’re not ordering, you can’t sit here.” But, as I said, these are minor issues. I strongly recommend the event to anyone interested in any aspect of, well, geek-dom, or whatever you care to call it. One other note- as the weekend progresses, and as it gets later on some nights, I’d really hesitate to call it a family friendly atmosphere. It’s not bad, nothing over the top, but still…. if I had kids, I really wouldn’t bring them to this. Just a thought. Also bear in mind the crowds. Last year the official numbers were 45,000 attendees. This year they said 52. Hope to see you next year at DragonCon! If you haven’t seen the Dark Knight Rises, stop here. Major spoilers lie ahead. If you have seen it, really liked it, and don’t want to hear bad things about it, similarly, stop here. I wanted to like it, I was looking forward to seeing it, I love hero movies, and have always been a fan of Batman, and I did enjoy the other two Nolan/Bale Batman movies. I will say it’s not the worst hero movie I’ve ever seen, nor even the worst Batman movie I’ve ever seen– Batman & Robin still holds that title in my book. There were some good individual performances in Dark Knight Rises: Hathaway did well as Catwoman, Oldman was his usual fantastic self as Commissioner Gordon (if a bit over the top at one point, and Hardy was decent as this version of Bane. And, of course, Liam Neeson was great, if all too brief, as Ra’s Al-Ghul. And that’s about the extent of what I’m going to say about this movie that’s good. Sorry, folks. There was so much stupid and/or “what were they thinking?” in this movie I don’t know where to start. I’m going to try and do this in some kind of order, but it may well be a long and wandering rant. Why Nolan, after giving interviews stating over and over again that there would be “no sidekicks” in any of his movies, essentially created a new Robin I have no idea. Let’s see, dark hair, orphan, figures out who Batman is on his own… Blake seems to be mostly Tim Drake, with the emphasis placed on his detective skills, and him deducing Batman’s secret is the same way Tim eventually became Robin. With five different Robins in DC’s present era, and another in the future, creating a new one makes no sense. And, of course, he too doesn’t appear in anything close to a Robin costume, although Tim Drake’s “R” symbol appeared in the background at the football game. Nolan really does seem to have a thing against costumes, as I think on it. Look at the villains he’s chosen for his movies. First movie was Ra’s, who’s never had a costume, per se, and Scarecrow, who does, but never wore it aside from the mask. In the second movie, we had Two-Face, who wears a suit, and Joker, who… Wears a suit. Everyone knows the image of Joker in his purple suit, which he was actually in for a small part of the movie. Most have probably heard the jokes by now about Bale’s Batman growl being difficult to understand at times. Add in Bane’s mouth covering mask, and then a scene with Gordon having an oxygen mask on in his hospital bed, and we’re ending up with a movie of unintelligible dialogue. I’ve read that when preview audiences had the movie screened for them, nearly all of them said they couldn’t understand a word Bane said. This was that much better? Nolan was ambitious in trying to tell a Batman story. Unfortunately, he apparently decided to try several at once. There are elements in this movie of Knightfall, the classic first confrontation between Batman and Bane. The return from a long retirement for Batman is reminiscent of Frank Miller’s the Dark Knight Returns. Gotham under siege, with bridges blown and cut off from the rest of the nation, was a main theme of No Man’s Land. Then we also add in the introductions of Talia, Catwoman, and Robin (c’mon, that’s who he was) and there is just WAY too much going on, and none of it does justice to the original storylines. As Batman and Catwoman infiltrate Bane’s tunnels, Catwoman cautions that Bane’s men are “No ordinary brawlers.” Batman replies “Neither am I.” He fights with skill against all the henchmen, and then devolves to less than a “common brawler” when fighting Bane. He throws wild roundhouse punches that, honestly, even *I* could have stopped. This is one of the world’s best fighters and planners? Use advanced skills against the thugs and then look like something out of an old Western bar fight against the big bad guy? One of big hurdles Batman had to face in this movie was… climbing a wall. With a rope around him, which he didn’t use. Can someone, in tiny words, explain to me why he wouldn’t just use the rope, clearly capable of supporting his weight and fastened very high up, to climb most of the way out? Wouldn’t that be easier, help him conserve his strength? Another pet peeve of mine in comic movies is needless changes. Bane has a very well documented place of origin, one of DC’s made up South American nations, Santa Priscia. Here, the prison Bane was in seems to be the Middle East or Northern Africa. There was NO reason to change this. Wasn’t much reason to change Talia’s origin either, aside from making us think Bane was Ra’s’ kid for most of the movie. While we’re touching on the prison, let’s look at Bruce’s miraculous recovery. Did you know that you can heal from major spinal injury by having someone hit you in the back and then hang you from a rope? Neither did I. Guess we can eliminate a lot of spinal surgery with this technique. And further on the issue of imprisonment, let’s look at the poor Gotham Police Department. The ones trapped underground are seemingly led by a cop played by Reggie Lee. Lee would be familiar to fans of the tv show Grimm, where he also plays a cop, and neither one of them can catch a break. But I’m not fussing about his bad luck. I’m more bemused by the fact that the vast majority of the GCPD is apparently trapped in caved-in tunnels for three months. During that period, not only do they not manage to escape, but none of them grow facial hair, and their uniforms stay miraculously clean. Pretty impressive for three months in a collapsed tunnel, having a barber shop and laundry down there. Commissioner Gordon can’t seem to stop making enemies within the Department. In this movie, his rival is Peter Foley, played by Matthew Modine. At first I thought it was just me, but talking with others later, I found there were more than one who thought he looked confusingly like Harvey Dent as played by Aaron Eckhart in the last movie. I spent his first few minutes on screen trying to work out how Harvey had come back from the dead with no one noticing. During the No Man’s Land-like portions of the movie, there’s apparently absolutely no way on or off the main island of Gotham, except the bridge they leave intact. Except for the never explained way Batman gets on there. And this lack of bridges utterly stymies the entire US military, including the special forces. Oh, if only there was some way to move troops underwater so that enemies couldn’t see them. You know, some kind of vessels that move beneath the surface, or maybe devices that let men breathe underwater. Maybe someday someone will create something like that. When some of the special forces do manage to get into Gotham, they are immediately captured and killed. Bane not only knows they are coming, but when and their ranks? He addresses the leader as “Captain.” Now since we find out Ms. Tate is a traitor later, maybe she called Bane somehow after she met the soldiers, but if that’s how he learned about them, he must’ve been hanging out by her door. How’d that work? Tate: Bane, they sent in soldiers, like we predicted. Bane: Of course they did. Tate: They’re here now, you’ll have to hurry. Bane: That’s ok, I’m right here, hiding in your closet. During the big final chase scene, there is all this tension and drama about the bomb. NONE of it makes any sense. Talia tries to remotely blow it, and is worried when the signal doesn’t go through, a bit odd if it only has about ten minutes till it blows. Then, as they drive the bomb around in the truck, Talia is concerned about being herded towards the reactor. If the reactor was booby trapped to flood when Lucius Fox tried to activate it, why in the heck was she worried about being steered in that direction? It wouldn’t deactivate the bomb, and if she’s willing to blow herself up, would she care if she drowned a few minutes early? Towards the end of the movie, Blake/Robin laments that no one will ever know who saved the city. Really? Let’s see… no one sees Batman for eight years. Wayne becomes a recluse for eight years. Wayne reappears on a cane, doddering around. Then he can walk with no problem. Then Batman reappears. Then, they both die at the same time. Oh, and the huge armory, including other versions of Batman’s “Tumbler,” was under Wayne Enterprises. Gee, no connections there between Batman and Bruce Wayne. There’s also Batman’s flying car or whatever you want to call it. It becomes crucial for the resolution of the plot. Fortunately, it remains cleverly hidden. Under a tarp. On a roof. For three months. Unseen by Bane’s pillagers OR the military satellites. And still flying perfectly despite the snow and cold and not being maintained. Of course, we also see the military order “high level recon” of the city, and then the very next scene is two fighter jets buzzing the city below the level of the skyscrapers. This is high level? For some reason, Bane’s trademark Venom drug is never seen in this movie. I guess that would be “too comic booky” or something for Mr. Nolan. Instead, Bane’s mask is “explained,” as keeping the pain of his injuries at bay. Right. Injuries from a beating linger years later, causing great pain that a mask prevents. Muuuch more believable than a drug like Venom that has real world analogues like steroids or something. Batman’s distaste for guns is well known, and makes perfect sense given his origin. Even given the darker tone of the movies, they keep that. But Catwoman using guns is very much out of character for her, and I really don’t care for the change. Also on the gun front, Blake/Robin accidentally kills one of Bane’s men in a fight. Just like any cop, he then tosses aside the gun, not only depriving himself of his weapon but possibly letting someone else pick it up. You get it drilled into you over and over as a cop, CONTROL YOUR WEAPON, not drop it on the ground. Also on the Blake front, at the end of the movie, he seems to have been picked to be Batman’s successor. Except he has no training, no info on how to find Batman’s trainers, no Alfred. But that’s ok, he’s got the Batcave, which apparently you can find by going through a waterfall on a rope swing. Really secure facility. Again, despite what this sounds like, I really am a huge Batman fan. I liked Nolan’s other two movies in this series. And I was looking forward to this one. But this wasn’t what I wanted at all. Add that to DC’s general poor track record with movies, and Superman’s apparently new found power to produce contrails from his feet in the “Man of Steel” trailer, and I’m really not optimistic about DC’s cinematic future.